We are an electronic fingerprinting service provider approved and certified by the California Department of Justice (DOJ) and the Federal Bureau of Investigations (FBI ) to provide Live Scan services throughout California. ♦ Government fees vary based on purpose of submission and some are waived for volunteers. 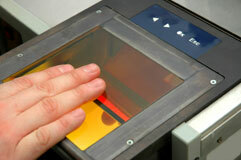 *Note: (FAQ) Live Scan & Ink Card Finger Printing.